Munster in Bern is a Gothic cathedral with a height of 100.6m in the old town Bern, Switzerland. Construction began in 1421 and completed in 1893. It is the tallest cathedral in Switzerland and the cultural values of national importance. Munster in Bern is situated on the south side of the peninsula Aare which is oriented eastern and western similar to the rest of the antique City of Bern. In the north, Münstergasse running alongside of the building and the western facade of the cathedral square is dominated by Munster with three-nave basilica without transept. There are a total of 10 coves in the building and the middle nave has 5 of these coves. Having 2 bays of each side naves by side chapels built on the external walls. The middle nave walls are supported by 14 flying buttresses. Starting at an adorned pillar every buttress rises over the roof of the naves and side chapels. Bottom of the buttresses are decorated with ovoid outs cut, Vesica Piscis and enameled designs. Most buildings built from local sandstone and the arches are built of brick in lovely styles. In 18th century, limestone cladding was added to the pillars and the most of the sandstone came from a quarry in Ostermundingen. Additional material came from the other three pits, each with a different color and quality. Different types of stone have been used more or less randomly throughout the building. The pillar bases, windows, capitals and sculptures all made of the highest quality, blue sandstone from a quarry Gurten, south of Bern. The three western entrances of the cathedral are located in the rear of the three major portals and each of the portals of different heights and different shapes and decorated. 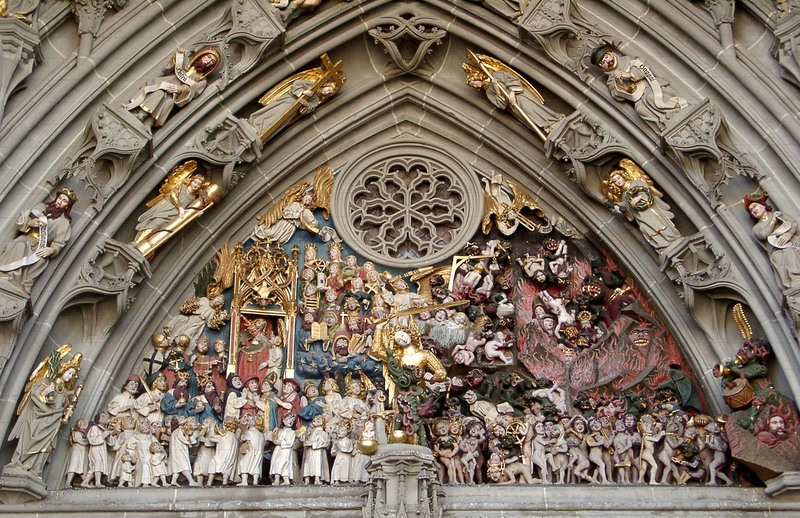 The central doorway is decorated with a succession of statues representing the last Judgment in Christian theology.